The Law Library has acquired two major databases for the use of Cornell students, faculty, and staff. HeinOnline Session Laws Library contains fully searchable images of the official bound session laws of all 50 states, Puerto Rico, and the Virgin Islands from inception to date. Session laws for all states are current within 60 days of the printed publication. Finally, it includes Acts of the Parliaments of Australia (1901-2011) and of Canada (1792-2011) and the Official Gazette of the Bahamas (1968-1996). Making of Modern Law: Foreign Primary Sources, 1600-1970, was just released this week. It offers fully searchable images of over 1500 historical legal codes, statutes, regulations, and commentaries on codes from the UK, France, Germany, Austria, Belgium, Hungary, Ireland, Netherlands, Norway, Romania, Russia, and Switzerland. Both databases may be used by all Cornell students, faculty, and staff both on and off campus with the links given above. Questions? Contact Nina Scholtz, Digital Resources Librarian, or Law Library Reference. “ The False Prophet!” shrieks one cover. “Confession of Ann Walters, the Murderess!” proclaims another. 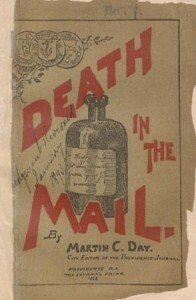 “Death in the Mail” is the lurid title of a third. These are all pamphlets digitized in the Cornell University Law Library Trial Pamphlets Collection, which has just received the American Association of Law Libraries’ Law Library Publications Award, Nonprint Division. We call them trial pamphlets because most are contemporary accounts of trials of prominent citizens or that dealt with especially controversial or lurid topics. Some are confessions; some include “execution sermons” (in which readers were given a moral lecture). As the titles quoted suggest, they were sold to a public eager to learn the juicy details of a recent murder or other crime. For present day scholars, the pamphlets offer not only valuable evidence, such as trial transcripts, frequently not available elsewhere, but also indications of the political, economic, and social transformation of the United States, especially in the 19th century. The trial pamphlets are freely available for full-text searching or browsing on the Trial Pamphlets Collection site. Law Library staff responsible for the project are Thomas Mills, Associate Director for Collections and Administration and Rare Book Curator, and Janet Gillespie, Access Services Manager. Barbara Berger Eden, Cornell University Library’s Director of Preservation, and the entire project staff made the digital collection possible. The Law Library is pleased to announce that HeinOnline’s Law Journal Library is now available to Cornell alumni. This database contains more than 1,700 law and law-related journals with a broad range of coverage. Alumni can search the database by article title, author, subject, state or country published, or by using keywords. Articles can be downloaded in a searchable PDF format. Cornell alumni can log in to Law Journal Library using their NetID. A log-in link is also available on our website (on the home page, scroll down to the link for HeinOnline Alumni Access in Research Tools). Don’t have a NetID? Go to Cornell University NetIDs to set up alumni access to this and other electronic resources provided to alumni by Cornell University Library. Currently, HeinOnline Alumni Access does not work with Internet Explorer 8 or earlier. If you are having trouble logging in to HeinOnline, please try using Internet Explorer 9 or 10, Firefox, or Chrome. For answers to questions about using Law Journal Library, please contact Nina Scholtz.